The aim of the journal is to showcase the writings of local historians about our locality, our people and places. The first issue was published in November 2017. It is called ‘The Irregular’ as we are not committing ourselves to a firm publication programme. The other reason is that it evokes the concept of ‘irregular troops’ which is how most of the men in our district would have been involved in combat, either as part of the Danish and Anglo-Saxon fryd (freemen mobilised to defend their shire) or as later volunteers. That being said we aim to produce at least one issue per year. There is a nominal deadline of 31st May each year but please let us have your ‘articles’ whenever they are ready. If you have not written anything before let us know and we can help you! You do not have to be a member to submit an article. We are looking for articles or comments of any length up to 7,000 words. We will also consider pictures, poems, letters or commentary – no matter how short. Please see our notes for contributors. We have been given a small grant by the County Council to contribute towards the cost of producing a ‘Special Edition’ on World War One during 2018. There are various projects and articles under way but if you would like to join in or contribute an article please contact the editors, Jeremy Lodge or Anne Speed, via our Contact Us page, or by post via the Jubilee Room. The Irregular will initially be available through the Trustees, the Village Archive (Jubilee Room, Swinderby Road) and at our meetings and talks. It can also be purchased in Collingham from Gascoignes Post Office (103 High Street). With some 170 sales thus far (November 2018) ‘Irregular 1’ has almost sold out. The second and third editions of ‘The Irregular’ were released together in November 2018 as joint WW1 Armistice editions and to coincide with our 3 day Armistice Exhibition on 9th, 10th, 11th November. As with Irregular 1, we have not limited our authors to writing just about people and happenings within our local parish boundaries, but have linked our local people and area to experiences they would have been through – such as issues prompted by ‘The Defence of the Realm Act’ – which had a direct impact on their lives. Bringing Irregular 2 & 3 to you together has been a great feat: 2 editions, 8 new writer/researchers, 11 Authors, 24 Articles, 400 pages, 60,000 words. Plus the Trail leaflet and the Exhibition brought to you by the same core team! 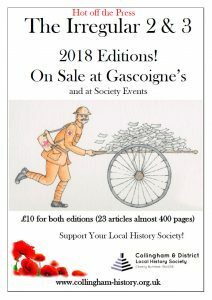 Thanks to the generosity of Nottinghamshire Local History Association, it has been possible to produce larger than normal editions of The Irregular. As usual these editions are well illustrated, mainly by images from the Society’s Archives. Irregular 2 opens with Pat Morgan’s and Charlie Stothard’s ‘Collingham and Brough Great War Village Trail’. The article accompanies a fold out leaflet which was separately produced and distributed. Pat has documented and located the shops and their owners, which local soldiers would have known. Charlie has identified the soldiers and many of their homes. Bridget Castle then looks at Collingham through an initial analysis of the 1901 and 1911 census, emphasising issues such as population and occupation, and picking out some of the people highlighted in the census. In two articles, John Forman takes a broader perspective and briefly explores some national and local issues concerning farming during the war and of course, Collingham Carrots! Jeremy Lodge then explores the menacing international undercurrents; issues of which most people were blissfully unaware, as we drifted inexorably towards war at this time. In contrast to the international machinations introduced by Jeremy, the people of Britain and Collingham were involved in celebrations for the 1911 Coronation of George V and the associated Celebration of Empire, illustrated in Sylvia Woodhurst’s article. Adrian Sunman’s article describes the great changes leading up to and during the war, which saw horse, steam and petrol engine sharing our roads. Drawing on national and local perspectives, Pat Smedley then explores key health and welfare issues of the time. Irregular 2 closes with Keith Morgan’s continuing exploration of Collingham’s public houses, this time concentrating on the Great War period. Irregular 3 begins with another article by Jeremy Lodge, featuring the local tradition of military volunteers (and the Irregulars from whom the journal title is in part taken) including the Boy Scouts, their role and aspect of their culture at that time. Britain found itself at war with Germany on 4th August 1914. On 8th August the first of several variations and subsequent amendments of the far reaching ‘Defence of the Realm Act’ (DORA) was introduced. Pat Smedley covers the extent of state control prompted by the act and how it proved to be the precursor to later nationalisation of many aspects of industry and life. Pat then follows with another article, describing the processes and pressures of volunteering, acceptance into the army and the training experienced by our future warriors experienced on their journey from Collingham civilians to soldiers in France and elsewhere. Russ Shand then describes the work of the local military tribunals, established to challenge and decide the fate of those who did not wish to be called up, after conscription was introduced in 1916. Janet Kelly writes of one of the great successes of the war – how we managed to move so many letters, cards and parcels so quickly, accurately and efficiently, between Britain and France during the war. John Forman then returns with a discussion of the Heavy Draught Horse, which was so important to the farms at home and the Army on and behind the front-line. Anne Speed looks at school life in the parish of Collingham during the war; the experiences and life of local schoolchildren and their teachers. Russ Shand follows with an examination of local policing at that time. Pat Morgan returns to highlight the difficulties of keeping our families fed during the war. Bridget Castle introduces the phenomenon of embroidered ‘sweethearts’, which soldiers, sailors and airman sent to their loved ones at home. Another logistical and organisational issue faced by the country at war, was how to care for and return the wounded home to Blighty. This issue is explored in an article by Sue Fleet. There was obviously much discontent during the war, one aspect of which was highlighted by a contemporary imagination of a 1919 Collingham peace procession, found in our Archives. Unfortunately the author is unknown. Jeremy has written a brief introduction on the relevance of humour in wartime and in times of strife. However the core of the article is the creativity sparked by the 1919 piece, resulting in a poem by David Scott and pictures by three of our talented local artists: Jean Wright, Harry Constantine and Ingrid Wiggins. Finally, two lists of names commemorate the men associated with Collingham; those who fought and those who did not return. Please let us know if we have inadvertently missed anyone and please forward any biographical details and photographs, which we can copy and return to you, to the Society, care of the Collingham Archives or one of our Trustees listed elsewhere on this website. The first edition of the Society’s Journal, ‘The Irregular’, was launched at our meeting on November 8th 2017. This edition opens with an article written by Keith Morgan about the Royal Oak and its various owners. Keith highlights the long and illustrious history of this building as a Public House, at a time when it appears to be slowly falling into dereliction after it was purchased by the Co-Op almost a year ago. Anne Speed then explores the 130 year history and some of the teachers at the Old School in South Collingham. The former School building is hidden away almost totally out of sight and is now a private residence. The last pupils left the School in 1962 when the present John Blow Primary School was opened. The Society’s Archaeology lead, Phil Docherty recounts the process and what was found when a ‘Test Pit’ was recently dug in a garden off High Street in South Collingham. Artefacts found reveal that the site had been occupied continuously for at least the last 1200 years. Evidence was also found of pre-medieval post holes, which suggest that the site was occupied much earlier. Pat Smedley explores the story behind the Crimean War gravestone in All Saints churchyard, North Collingham. She relates the likely experiences of two Collingham men and their brother-in-law in the Crimea. They were all members of the 17th Lancers and were in the vanguard of the Charge of the Light Brigade; only one of the three survived. Jeremy Lodge recounts a conversation with a Collingham resident about her experiences of fighting in the bush against Robert Mugabe and other insurgents during the Rhodesian War, or as it is now known, the Zimbabwe War of Independence. Christine Hasman then relates the tale of John Tom Carter, who was born and died in Collingham. In between he had a ‘shockingly turbulent’ time as a Policeman in Otley when he murdered three members of his family. David Barker tempts us with a taster of the mystery of Elton Hall in North Collingham. You haven’t heard of it? Neither had we! So watch this space and future issues. Jeremy returns with the story of Richard Domenichetti, whose father incidentally was one of the key people in the establishment of the Old School that Anne wrote about earlier. Richard was an Army Surgeon who witnessed some of the horrors of the Indian Mutiny. The Journal ends with a poem on the history of South Scarle, by local actress and poet, Tina Paris of that village. The Journal is on general sale priced at £6. It can be purchased in Collingham from Gascoignes Post Office (103 High Street). It will also be on sale at the Society’s meetings and in the Jubilee Room. When bought directly from the Society at the Jubilee Room or at our meetings, at these times only, members can claim a £1 discount on production of a current membership card. At 140 pages in A5 format we hope that you will agree that it is good value and worthy of a place on your bookshelf.